Kamala Beach is a great destination for families and there are plenty of kid-friendly activities nearby. When you need a little time to yourselves, our Kids’ World is on hand to help. A ball pit, suspended pod chairs for cozy reading time, a cinema room with bean bags. What more could your kids want? Well, special children’s activities, toys and video games, for starters. To give you peace of mind, our Kids’ World supervisors are all experienced child-minders. We even offer a quiet area with comfy cots and professional babysitting services – leaving you free to explore Kamala’s adult-oriented highlights. A multitude of our activities are geared towards kids. While they try their hand at various arts and crafts – like soap painting, bracelet making or rasta hair styling – you can participate in an activity for adults. But no one will hold it against you if you simply want to relax by the pool! There is also a vast play area devoted to keeping kids from the ages of 4 to 12 happy and babysitting can be arranged. Kids’ World is open from 09.00 to 17.00. When was the last time you had the chance to try something new? 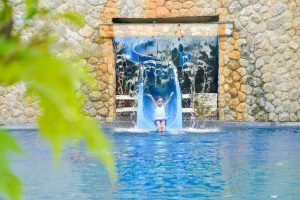 Here at Swissôtel Resort Phuket Kamala Beach, each day offers a fresh agenda of fun activities for the whole family. Get creative with batik painting and origami. Stay in shape with Thai boxing, an invigorating morning run or a session of Fit Ball. If you don’t mind getting dizzy, take a spin in our water balls. Once you master the technique, you’ll be walking across the lagoon pool in style. For snorkeling outings in the crystalline waters of Kamala Bay, check the weekly schedule. Adventurers can also hop on a bike for a unique tour of the island, or take a long tail boat tour for a different point of view and some fishing. For even more thrills and excitement, our tour concierge can send you trekking with elephants or on an intense ATV safari. They can also arrange trips to James Bond Island, Phi Phi Island and Phuket FantaSea. Simply ask at the Front Office for more options and details.